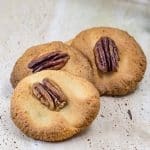 This delicious batch of Low Carb Pecan Cookies is the Keto version of the butter shortbreads that everyone loves. Simple crumbly cookies, perfect to share. Preheat your oven to 160C/320F and prepare your cookie sheet by lining with parchment paper. In your food processor add the almond flour, natvia, baking powder and butter. Pulse until the mixture starts to stick together. Add the egg, vanilla and Sugar-Free Maple Syrup and blend until it is all combined. Scrape the mixture out into a mixing bowl, and roll together using your hands (we find food safe gloves great for keeping your hands clean). If the dough is too sticky, add an extra tablespoon of almond flour and gently knead through. Split the dough in half and each half into 8 evenly sized pieces, roll each piece into a ball and gently press onto your prepared cookie sheet. The cookies do not spread and will retain almost the same shape that your press them into. Press a pecan half into the centre of each cookie. Bake in the oven for 15-20 minutes. They are cooked when golden brown with firm edges. Allow to cool before enjoying.